St Petroc’s Church of England Primary complete our school visits programme! On 6th and 7th October, year three from St Petroc’s Church of England Primary School, Bodmin visited The Hurlers and surrounding area for an active day of archaeology and geology. 41 pupils arrived each morning at the Heritage Centre carpark to be met by geologist Calum Beeson, archaeologist Emma Stockley, volunteers from Saltash U3A and Reading the Hurlers’ Moorland Guides, Steve Hopkins, Paul Lovell and Keith Rawlings. The days were in stark contrast to one another with the 6th being beautifully cold and clear whilst the 7th was misty and wet. Each visit started with a walk to Rillaton Barrow to discuss how archaeologists use evidence to learn more about how people lived in the past and a stop at our recent Cornwall Archaeological Unit-led excavation, was an opportunity to learn more about the process of an archaeological dig. A fun activity at The Hurlers involving a lot of running gave everyone a chance to warm up before lunch at The Heritage Centre. Calum led the afternoon activities by explaining the mining landscape before wowing everyone with 400 million years of geological history in under 15 minutes – complete with examples of cassiterite, slate, pillow lava, copper ore and galena. In between activities we saw frogs, birds of prey, woolly caterpillars and of course the ponies, sheep and cattle. 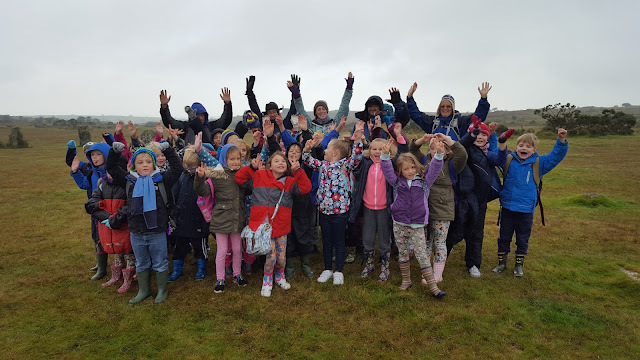 Despite the cold and at times, the wind and rain, all 82 children and their accompanying teachers and parents had a fantastic and very memorable experience. 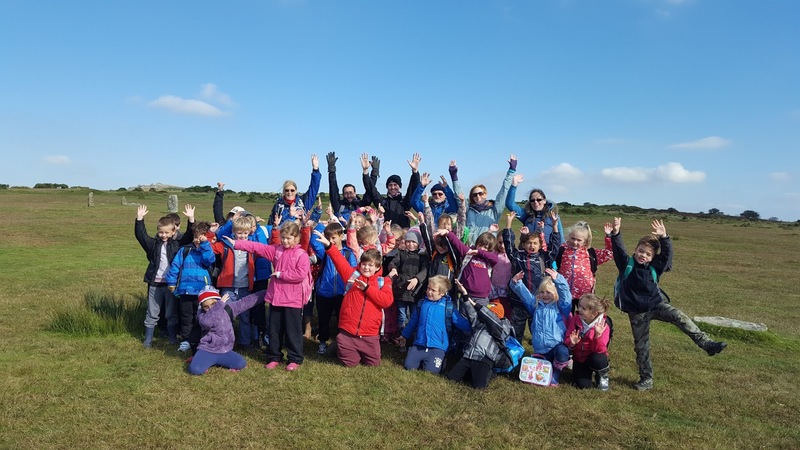 The visits by St Petroc’s complete the Reading the Hurlers programme of school trips and the project has succeeded in enabling 274 local primary and secondary school children to experience at day on Bodmin Moor exploring the area’s prehistory and geology. We have worked hard to ensure that our schools programme is accessible to all and our visits have included children with a range of additional needs including autism, mobility issues and those needing extra social and emotional support.  Huge thanks go to Cornwall Heritage Trust who have financially supported our schools programme, the U3A volunteers who have provided additional help and support on the day (special mention to Saltash U3A geology club leader Pat Fitzsimmons) and our Moorland Guides, Steve, Paul and Keith. Lastly a big thank you to all the teachers and pupils who have participated – we couldn’t have done this without you!